But only if they choose to reexamine their attitudes towards their own Jewish identity. The election of Donald Trump for president has exacerbated the split in American society, but even more so, the inner contradictions of its Jewish citizens. Of the over 70% who voted for Clinton, most feel angry and downright frightened of their upcoming president and the wave of anti-Semitism they are experiencing. 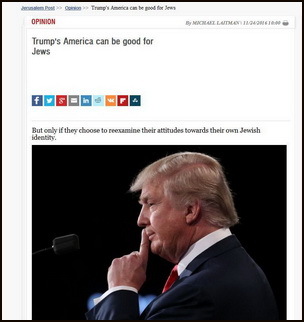 Other Jews who voted for Trump for his pro-Israel agenda, argue that the supposed rise in anti-Semitism since the elections is merely putting the focus on something that was evidently widespread before, albeit in different form, as in the case of American campuses which are awash with neo-liberal, politically correct thinking. They understand that anti-Semitism exists both in the hard right and the hard left, and so do not believe either choice would have secured their safety. And then there are the Jews who are themselves split in half between their American liberal upbringing and values, and their inclination to do what is best for the state of Israel. These differences can be easily solved, if we step back and see what is truly at stake. Jews who are protesting Trump may claim that their resistance to this change is actually an upholding of their Jewish values; however, what we must see is that American Jewry was about to disappear thanks to the period of affluence, acceptance, and equality that had brought about assimilation, intermarriage, and low birthrates. Surveys show a very grim portrait of the health of the American Jewish population, as Jack Wertheim, Professor of American Jewish History, puts it, with rapid assimilation sweeping through every branch of Judaism except the Orthodox. Its ties to Israel were also fraying. It is the recent elections that brought the entire liberal system to a halt, in the aim of turning back its destructive route in terms of the economy and utter instability the world had come to, but also shocked the basis of the Jewish community which was happily losing its identity in return for its success. For Jews, the election brought out the ancient conflict between being successful individuals and a people that remain faithful to their roots. Throughout history Jews have been going through the same pattern, assimilating in part into a foreign culture, be it Greek culture in the days of the Maccabees, that of Spain before the Spanish expulsion, or 1900s Germany before the rise of Hitler. In these and many other cases, our people realized in terrible ways that becoming part of the herd was always rewarded with a great surge of anti-Semitism that would force them back into their Jewish identities and their own culture. For centuries Kabbalists have known the reason for this terrible backlash. They understood that Jews, divided as they may seem, actually hold within them an ancient promise to pave the way for unity and peace for all of humanity. American Jews who are struggling with the election results are now facing this same historical conflict between fighting for their place in a foreign culture and seeking new answers within their own heritage that could truly transform reality. I urge them not to wait for anti-Semites to label them as Jews, but rather know that they are the ones who hold their future in their own hands, as well as the future of America and the world at large. It’s not about Trump or Bannon, or any of the repercussions we are seeing as a result of this election. The key to calm, peace, and to the values they wish to uphold is within our Jewish identities and connection to the state of Israel. For within our people is an ancient wisdom and capacity to become the example of the relationships we all want to see in modern societies. In the early 1900s, Rabbi Kook and Rabbi Yehuda Ashlag (Baal HaSulam) tried in vain to warn the leaders of the great Jewish communities of Eastern Europe of the terrible outcomes of their exile, both physical and spiritual. My teacher, son of Rabbi Yehuda Ashlag, Rabbi Baruch Ashlag, told me of the times he had visited Israeli Prime Minister David Ben Gurion together with his father. He witnessed his father’s attempts to convince the prime minister of the necessity to unite the different factions of the Israeli society, which was divided even then and of the importance of achieving the correct relations with our Arab neighbors. He explained that the method that would allow this to happen exists deep within the Jewish Nation, in the authentic Wisdom of Kabbalah; that it is our only hope of achieving peace amongst ourselves and with the rest of the world, and by that, become a light unto the nations. Unfortunately, Ben Gurion never accepted these recommendations as guidelines to his path, and we suffer the results to this day. As we now step out of the neo-liberal crisis, we find ourselves in a world that is searching for a cure for its deep divisions and strife. This dire need humanity has come to is of no coincidence; neither is it a coincidence that Israel and Jews have always been put at the center of all misfortunes in the world. The reason is that Jews have the power to heal and prevent these crises by modeling and transmitting the inclination to be “as one man with one heart” and to “love your neighbor as thyself” to the rest of humanity by their own example. But they must first discover this truth about themselves. Kabbalists have tried to explain again and again that it is the lack of this understanding that keeps the nations of the world demanding of Jews to change their ways, as it is written, “No calamity comes to the world but for Israel (Yevamot 63). This is the reason for the seemingly unfounded hatred, which ironically, is forever keeping Jews from running away from their unrecognized role. The Jewish people have never been able to escape their historical mission. Paradoxically, it was the enemies of Jews that kept Judaism alive. But it doesn’t have to be that way forever. This election brings the possibility for change from a path that may have seemed comfortable for the time being, but was effectively bringing American Jews to extinction and the world to utter chaos. At this critical crossroads, we must choose to break the ancient pattern that makes sense to a western liberal rationale, but is actually illusionary and detrimental to the Jewish soul. By opposing Trump, Jews are not opposing racism or hatred, they are merely trying to go back to a system which allowed them the liberties to escape their destiny. They must choose to reconnect to Israel and to the true destiny that it holds as a light unto the nations. This is the only way they will ensure that Trump’s presidency steers away from the far right and unto the middle path, becoming an historical opportunity for reshaping the failing relationships and attitudes of the past, bringing about security, well-being and prosperity for all.